MEETReads are free, community events in which kids, from preschool to high school, come together to read and discuss books that have been chosen specifically for their power to put readers in another's shoes and push them to see the world from a different perspective. We believe that if the next generation is more educated, more empathetic, and more empowered to speak up for themselves and others, they can make the world a better place. Reading about all kinds of people and talking about those books with all kinds of people is a way to foster that education, empathy, and empowerment. Because teaching reading is what we do at EdBoost, we will start by compiling the reading lists, writing the background info and discussion questions, and launching the first MEETReads. Because we live in the diversity of Los Angeles, we'll record our kids' discussions and distribute them as podcasts so others can easily start MEETReads in their own communities-- and so that teachers, parents, and readers everywhere can use our discussions to jumpstart and supplement their own. If the 2016 election has taught us anything, it's that our nation is divided. So-called Red States and Blue States don't have much in common -- or at least they don't know if they do. Each side is stuck in its own bubble. And, if there's anything you learn, working with kids, it's that their capacity for empathy and understanding is tremendous -- but they find it hard to come to that empathy in the abstract. Telling a student that it's not kind to call someone "gay" is a hard sell. "Everyone says it!" they will reply. But, have that same child befriend a gay student or student with gay parents, and suddenly that child is a champion for kindness who starts calling out his friends for using hurtful language. For our students, like so many children, the gateway to understanding is giving them some specific shoes to walk in. It's hard to say, "Imagine you're an immigrant, or a Muslim, or have a learning difference." But, it's easy to say, "How do you think Omar might feel about that?" Or, "If you were Alexandra, how would you react to that?" And we are very lucky. We live in one of the most diverse zip codes in the country (ranked number 7 in Los Angeles on the Diversity Index -- and that doesn't even account for how many different countries, regions, and religious backgrounds students in Palms come from!). Most of our students know a Muslim, a Sikh, an undocumented immigrant. These are their friends -- and they defend them. But, our students do not know rural America. If you ask them where milk comes from, they almost always reply, "The store!" with a "no-duh" kind of expression. For all of their worldliness, these kids don't know how to work with their hands, how to build things, how to grow food, or raise an animal, even what it's like to see stars on a really dark night. So, we keep thinking: what can we do to educate children -- our children and other children -- about others. How can we get kids to "meet" kids and worlds and lives that they don't know? How can we increase the number of "other people's shoes" that they can walk in? For many of us, so much of our understanding of others comes from friends that we've made between the covers of a book. I may not personally know people from all over the world, but I've met them through reading. And, what we do at EdBoost is read with kids. We read and we talk -- and we help kids to read and think better. 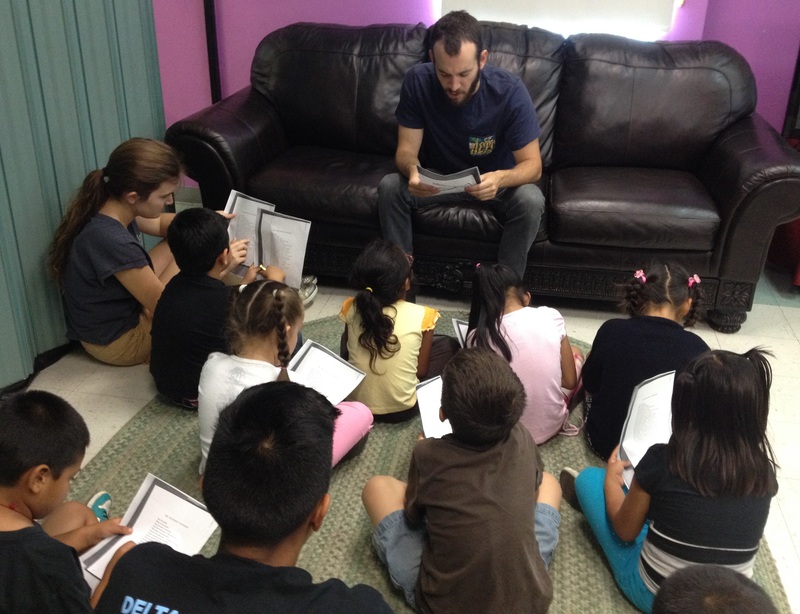 (In the photo above, our tutors are reading Shel Silverstein poems with a group of kids at the Children's Collective in South Los Angeles -- working on "finding the funny.") We decided that the best way for us to help build empathy is to hold big, free events, with as many little and big readers as possible, and read books that will help them explore humanity. We came up with MEETRead. We'll have different sessions for kids of different ages. In each session, we'll read a book (or the first chapter of longer books) to the students and then lead a discussion and let the kids talk and explore and share their own experiences as they relate to the books. We'll send the kids home to finish and reflect on the books we started (or, for the little ones, with similar books). We'll meet again to discuss the books they read, and record those discussions to be disseminated as podcasts. We'll crowd-source the best books that contain a wide array of characters: expanding kids' worlds through amazing books. We'll post these lists online so teachers, parents, and community members all over the country can introduce their kids to these books. We'll create packets of background information and discussion questions (as well as a list of "heads-ups" for adults so that they know what tender topics might come up while reading, and suggestions for how to handle them) for each book, and make those packets available online so anyone who wants to host a MEETRead in their own community (or just do some great reading) can start quickly and easily. We'll distribute the podcasts, so that teachers and parents and reading group leaders who might not have access to the diversity of Palms can supplement their own discussions with the voices of our students. Finally, we'll build a reading community here in Los Angeles, grounded in regular events (with snacks and fun) and, hopefully, an on-going community of folks who care about reading, education, empathy, and learning. The first thing we need are book recommendations. We have a huge list of books that we use here (EdBoost Executive Director, Tiffani Chin, has been thinking a lot about her personal list, past and present), but we know that it isn't complete. We need more books for small kids, more books about gender/transgender issues, more science fiction, mystery, and adventure books that also deal with issues of difference. We're crowd-sourcing this! Go to our Facebook page and join the discussion: what other books should we be looking at? Next, we'll need volunteers to read to kids, facilitate discussions, record and edit podcasts, and help out in general. Do you want to make a difference? Spend Saturday morning with a MEETRead! If you're on board, we're compiling a general go-to list. We'll get details out about the first event ASAP (probably just after the new year). Finally, we're going to raise some money. We'd love to give students the books we'll be using at the MEETRead, so the kids have no excuse not to dig in. We'd also love to do some promotion of the discussion guides and podcasts that come out of the MEETReads. You can always donate through our website (note MEETRead in the purpose box), but we'll do a proper fundraiser in a few weeks. We woud love to see MEETReads happen everywhere. We'd love to see MEETRead discussion packets and podcasts being used in schools, homes, afterschool programs around the country. We'd love to be a small part of the force that will be pushing the next generation OUT of their bubbles to learn more, about more types of people and more different lives, and create a better, more compassion world. Smarter kids, better world.